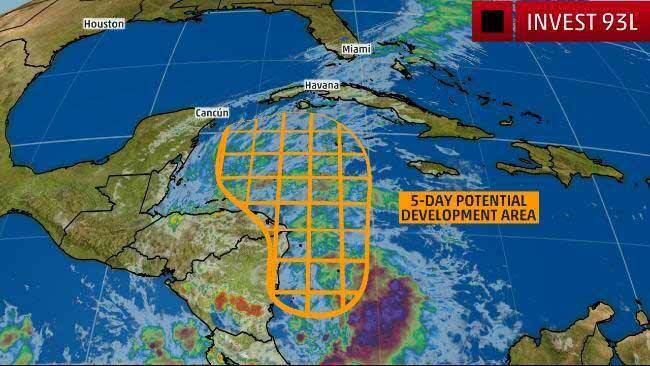 The western Caribbean will be the spot to watch throughout this week for signs of tropical development. Satellite imagery indicates there are shower and thunderstorm activity occurring from the southwestern Caribbean to the coasts of Nicaragua and Honduras. I think that the convection that is now happening over the southwestern Caribbean will be the area that eventually develops into a tropical system later this week. Analysis indicates that there are some falling barometric pressures over the southwestern Caribbean and that the wind shear values over the this area are favorable (5-15 knots) for development. Given this, I think that we will see a low pressure system form over the southwestern Caribbean by about Wednesday or so with this low pressure system potentially strengthening into a tropical storm as it moves northward into the northwestern Caribbean and towards Cuba, southeastern Florida and the Bahamas by Friday and Saturday. 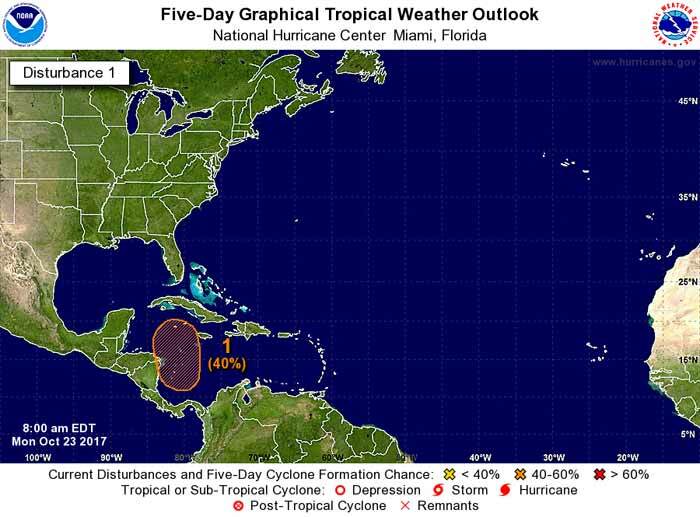 I am putting the chance of the development of a tropical storm in the western Caribbean near the Cayman Islands at 45 percent. The most likely timeframe for this development to occur is between Wednesday and Friday. It looks very likely that whatever forms in the western Caribbean (tropical depression, tropical storm, hurricane) will be pulled north and northeastward into a trough of low pressure over the East Coast this weekend. This means that there is the potential for at least tropical storm impacts for the Cayman Islands and western Cuba Thursday through Friday and the possibility for some impacts from this system across southeastern Florida and the central and northern Bahamas on Saturday. Beyond this, the combination of this tropical system being entrained into the eastern US trough could bring extremely heavy rainfall from the Mid-Atlantic States northward into the northeastern United States from Sunday through Monday. I continue to keep a very close eye on this potential western Caribbean tropical development and will have additional updates for you throughout this week. With or without development of this system, Belize is experiencing very heavy rains and with more on the way. Flooding has to be a distinct possibility. An area of low pressure with the potential to develop into a tropical depression formed in the Western Caribbean near the northeast coast of Nicaragua on Monday evening, and was designated Invest 93L by NHC. 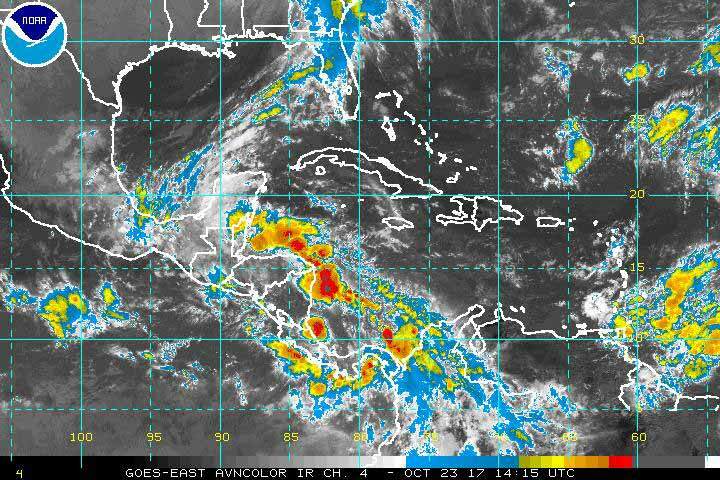 The system will move slowly northward, bringing heavy rains to Cuba by the weekend. The system may also bring heavy rains to South Florida and the Bahamas by Sunday, but due to the uncertain nature of the formation location and track of the storm, it is not clear which region might be at most risk. Satellite loops on Tuesday morning showed 93L had a modest amount of heavy thunderstorm activity that was disorganized. Conditions were quite favorable for development over the Caribbean waters off the coast of Nicaragua, with moderate wind shear of 10 – 20 knots, ocean temperatures a very warm 30.5°C (87°F), and high moisture at mid-levels of the atmosphere. Proximity to land and lack of spin are the main impediments to development at this time. Though the current model predictions for 93L are not especially concerning the Western Caribbean is a notorious breeding ground for violent late-season hurricanes, and we should watch 93L with vigilance. The 0Z and 6Z Tuesday runs of our top three models for predicting tropical cyclone genesis--the European, UKMET and GFS models--had one of them, the UKMET model, predict development of 93L into a tropical storm by Friday. The European and GFS models were predicting that 93L’s close proximity to land would interfere with development, and only about 20% of the 70 members of the 0Z Tuesday GFS and European model ensemble forecasts showed development. In their 8 am Tuesday Tropical Weather Outlook, NHC gave 93L 2-day and 5-day odds of development of 10% and 50%, respectively. The next name on the list of Atlantic storms is Philippe. The Rain is not going away anytime soon - Environmental conditions are expected to be conducive for some development to occur while the system moves slowly northward over the northwestern Caribbean Sea. On this Tuesday, NHC is watching a broad area of low pressure located over the western Caribbean Sea near the Central American coast. The system's close proximity to land is likely to limit development during the next day or two. Thereafter, environmental conditions are expected to be conducive for some development to occur while the system moves slowly northward over the northwestern Caribbean Sea. It has a medium chance (50 percent) of becoming a tropical cyclone during the next five days. We are currently monitoring a broad area of low pressure over Central America that is producing areas of heavy convection and flooding rainfall. Northern Honduras, far southern Belize, and northeastern Guatemala are expected to receive the brunt of this heavy rainfall associated with this broad area of low pressure. Rainfall amounts across these locations can receive anywhere between 7-12 inches of rainfall through Friday. This will be a prolonged area of rainfall and will lead to potential mudslides and property damage across the region. As a disturbance approaches from the northwest, this broad area of low pressure will be lifted northward towards Cuba. There is a small chance for development this weekend, but the inhibiting factors preventing this developing into an organized tropical feature include land interaction, frictional drag due to the speed of the system, and strong wind shear. However, the water this area of low pressure is over will be quite warm, so there will be a small chance for development. TROPICAL LOW 93L, overall, remains disorganized, but has shown better signs of slow organization. All people/friends in Central America including Nicaragua, Honduras, Belize, the Yucatan of Mexico, western Cuba, CaymanIslands, and Jamaica. 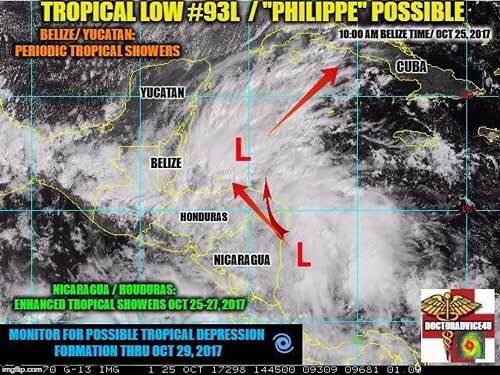 should monitor 93L for possible formation of a TROPICAL DEPRESSION or TROPICAL STORM (to be named Philippe) thru late weekend, October 29, 2017. Steering currents are weak; however, a cold front entering from the USA will likely steer this entire tropical system to the northeast by late this weekend. The key word for today, is to continue to monitor 93L, and expect an enhanced risk of tropical squalls especially along coastal areas.